Mommy, where do chords come from? There gets to be a time in everyone’s musical development when the question comes up. You know how to play a lot of chords. But where do they come from? What makes a D chord a D chord? What makes a D chord different than a D minor? Well this guitar lesson is going to dig into the basics for chord construction. Both in general music theory terms, and specifically how it applies to the guitar. For more on chord construction and how it applies to the neck of the guitar, check out my Rhythm Guitar Mastery course. 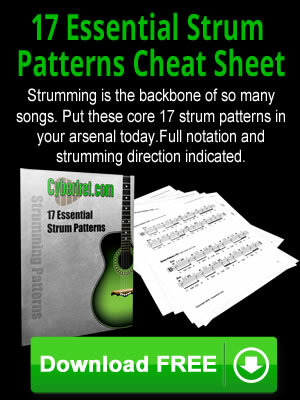 I have a whole section dedicated to chord theory. Plus you will build your vocabulary rhythms, strums & chords. *A diminished chord is just another “flavor” of chord sound. Plain 3 note diminished chords are not very common on the guitar. So for now you are going to learn that they exist, but don’t lose sleep because you don’t know how to play one. The first chords that we are taking a look at are sometimes referred to as triads. A triad is just a term for a 3 note chord. It’s a little easier to visualize how chords are created on the piano as opposed to the guitar. The video below shows these seven chords and how they would be played on the piano. The white keys from C to C form a C major scale. Therefore to create the basic chords, you skip every other white key. This video does not have any sound.